We were running against time. To get that perfect sunset shot at Gili Trawangan island we had to leave Lombok island on time, precisely 2 pm. Lombok island in Indonesia had won my heart with its rugged scenic beauty and exquisite landscapes: one moment we drove under tree canopies, the other moment we were awed by towering cliffs overlooking endless azure beaches. And just when I thought oh it’s just about beaches, it enthralled me with its raw, earthy green fields and bountiful plantations. But right now the highlight was to catch the sunset at Gili Trawangan. What was the big deal? Just a sunset right? Sometimes you see a frame somewhere and nurture a dream to be a part of it and to live it. Travel throws so many such opportunities at you to create frames that you never knew existed: frames that enchant you, take you by surprise. But there are some trademark, iconic places that you want to be a part of. Those instagramabble frames (done to death) but you still want to be a part of them. No, it isn’t FOMO (fear of missing out). The frame is ready but the subject is unique, isn’t it? Mine was 1 hour away from the Lombok harbour. The slow boat swished along turquoise waters as the sea breeze sprayed a little bit of the sea on me. The dancing waves with music of its own, the different hues of water: cyan, teal, azure, turquoise: a lilting happiness. 30 mins later and several photos later we finally reached the harbour of Gili Trawangan, where Sam our guide broke the heartbreaking news to me: We had to rent cycles on the island. Memories of childhood cycling mishaps encircled my mind, as I inquired the next option. “Horse cart!” He announced, my heart sank further. I abhor animal ridden transport. So now the choice was to risk a few broken teeth vs sympathy with the horse. And needless to say the selfish -me (remember the postcard sunset shot?) chose the ‘safer’ option. Off we went, through muddy tracks, lively cafes passing by in a whirl , sea facing bars bursting with enthusiastic tourists, shops selling beachwear and providing snorkelling equipment on rent making brisk business. Gili Trawangan is a relatively small island: it’s rawness intact and the sea being it’s main feature. Most of the resorts are sea facing and a stone’s throw away from the shore with practically all of them providing cycles on hire. Time on the clock : 4.45 pm. Pedestrians needed to leave early for the ‘sunset’. So there I was, schlepping my weary self to the shore. I decide to make the walk to my picture point : The famous Ombak Sunset Swing, along the shoreline. There is something about solitude and the sea. Waves rushing towards you and tickling your feet for a tad bit and receding. As if vying for your attention. When you oblige, they act pricey receding further, baring the treasures of the sea : corals and shells alike. And the show isn’t over. They gush and roar like privy to your secrets and why you’re here. The walk continued as the sky turned dramatic: a blanket of thick clouds and colours of the sun splitting into various cloud blocks each giving a different shade: tangerine, chest-nut, copper. The whole stretch had close to four swings. But I trudged all the way to the one at Ombak Sunset resort. These famed swings form a trio on the beach, inviting tourists from far and wide to sit on them. My predictions weren’t incorrect: There were scores of people queuing up for ‘THAT SWING PICTURE’. The waves were in a frenzy. With a high tide approaching, the swing was visibly submerged but no, it still did not lose it’s charm. I had to do it. The pedestrian had walked a good 3 km for this. High tide or not, this had to be done. After patiently waiting I enter the warm waters , treading over the hard corals towards the swing. The skies resemble a canvas with strokes of brilliance all over. The waves that acted pricey a while ago, hugged in a tight embrace as I sashayed towards the swing. Knee length was now waist length and I realised it was practically impossible to sit on the swing, let alone swing. I STOOD on the swing! Grateful for the sturdy ropes, I climbed up and the sea breeze hit hard. I was now facing the descending sun, huddled in the company of clouds. The maddening crowds behind me: the waves taking care of them. But this moment, this very moment was mine. It was just me and the sea and the joy of standing and swinging seeing the sunset. For a fraction of a second, this felt overwhelming. Like magic. Photos were taken, the moment was frozen in frames but the joy for that one minute was blissful and left an indelible imprint in my heart. It was almost twilight now and the party goers were tripping on music. But for me the song of the waves celebrating my tiny feat, sufficed. I walk back to Jambuluwan resort slowly, weary, exhausted but happy. That one moment of joy had overpowered all the fatigue. Funny isn’t it? A phenomenon as common as a sunset being a highlight of your to-do things.But sunsets like these are special. They happen everyday but what makes them so special is you being a part of the phenomenon. That doesn’t happen everyday. Does it? Gili Trawangan is the largest of three Gili islands part of Lombok. The other three are Gili Meno and Gili Air. The islands are located in the Lombok Strait, northwest of Lombok. The name Gili Trawangan literally translates to Island of the tunnel. The name Trawangan originates from the Indonesian word Terowongan (Tunnel) due to the presence of a cave tunnel built there during Japanese occupation in World war 2. Bali lies about 35 km to the west of Gili Trawangan. There are direct flights from Bali to Lombok (40 minutes duration) after which you can take a cab to the Bangsal harbour where there are hourly boats leaving for Gili Trawangan. Gili Trawangan can also be reached by a 4-5 hour ferry from Padang Bai in Bali to Lembar in Lombok followed by a 2 hour taxi ride from Bangsal harbour and an onward ferry to Gili. There are no motorised vehicles on the island. So tourists have to rent cycles or take a cidomo ride ( Horse cart). All the three islands offer excellent diving, snorkelling and water sports opportunities. There are Turtles along the corals at Gili Air. Mount Rinjani, Indonesia’s second highest volcano can be seen on the ferry from Lombok to Gili Trawangan. Mount Rinjani in the background. Best season to visit: The Gili Islands enjoy a warm, tropical climate and a dry and wet season.Dry Season usually lasts from May until October, with Monsoons starting in November and continuing through to April. Temperatures range between 22 °C to 34 °C, with an average annual temperature of around 28 °C. Jambuluwak resort has well maintained, modern cottages with plenty of greens surrounding them. The resort has a spa as well. A word of caution for the vegetarians: There isn’t a plethora of vegetarian options on the island ( as compared to Lombok or Bali) so be well prepared. Disclaimer: I was invited by Indonesia Tourism and Garuda Indonesia India for this trip to #wonderfullindonesia . SUGGESTED READ: Bali Beyond beaches: of Hinduism and artistic villages. The word magical won’t cut it, this is beyond magical. You gave a new meaning to clichéd photospots. Much respect, Div! I just wish there were Veg options to eat, that would make life easy for many. These are eye-popping images Divy. We have been to Bali many times but never make it over to the Gili islands. So many folks have visited and just love the place, and I see from your pictures and story that it is a great time. Next time we see Bali we’ll have to make the trip over to the islands. A different feel than some of Bali for sure, with a more relaxed pace of living. I agree with you on animal transport. I do get that these horses are trained to pull folks around but I avoid it. Being by Central Park right now and doing my runs over there I just want to cut their harnesses and send them on their way. Wow! Looks so amazing and such great captures!! Enjoyed it, as always! Great opening description of Lombok Island; I could picture it. Your trip to Gili Trawangan Island looks beautiful. I love traveling on the water like that (as someone who owned a small boat most of my adult life). Again great description of the water and the journey to the swings. I love the idea of sitting in the water on the swings watching the sunset. Exquisite photos of the sun setting! When we go to Bali, I will check out this island. Thanks! The swings look spectacular in photos but I imagine it wasn’t quite that serene if there were people waiting in line to photograph it, lol! It would be lovely to sit at that beach cafe and have a meal facing the water. What an incredibly beautiful place! The colour of the water is out of this world. It seems that your mini adventure to catch the sunset paid off. OMG, your photos are amazing! Serious wanderlust! I had never heard of Lombok Island, now I must go! What a journey but those sunset photos are worth it. 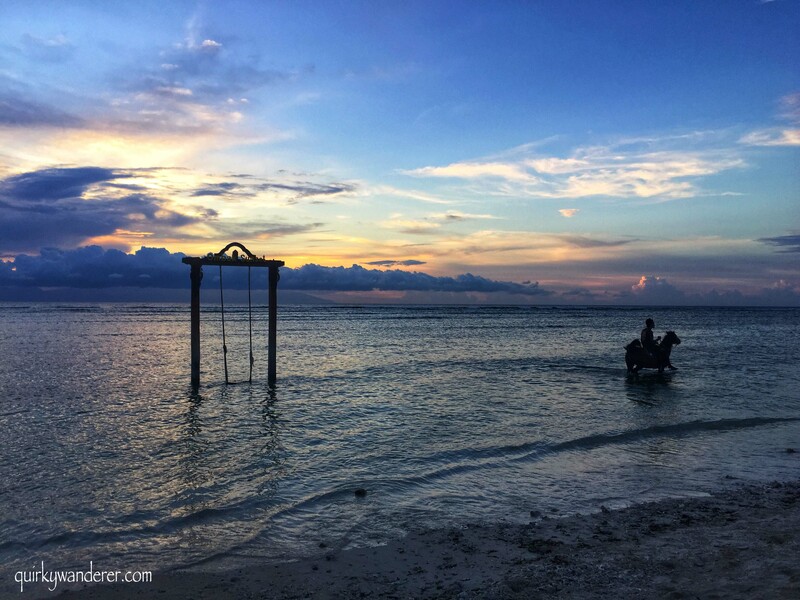 I recently visited Gili Tranwangan myself and was so in awe of the gorgeous sunsets too! I think I must’ve clicked about 100 pictures of just the sunset, in a span of 2 days. The swings in the ocean are absolutely gorgeous. I stayed at The Exile and it was amazing experience, looks pretty similar to the one you’re recommended in the post. Can see why you were so keen to make sure you didn’t miss the sunset there, and you got there in good time to find the right spot. That swing is so cool, creates a really good silhouette opportunity and fun at the same time. This is just what “paradise” is in my own dictionary! I completely fall for the blue water, the picturesque scenery, the beautiful resort and the cute swing! Thanks a lot for your photos and your story – omg I can’t wait to be able to come there! I definitely know the feeling of racing against time, trying to get that perfect shot. Looks like you got some fantastic photos though, and the place looks absolutely beautiful! Will definitely be adding this to my bucket list! Beautiful, beautiful images! I love the sunset swing picture with you standing up – if that was me I’d have a print made and put it by my bed so I could keep dreaming about it. And the swing with sea horses picture too. I’d never heard of Gili Trawangan Island – now it’s definitely on my own wish list along with Lombok! The sunset is stunning at Gili Trawangan but i can’t imagine how crowded that beach was to get the swing sunset shot. I enjoyed reading about your journey and I would love to take the boat ride over from Lombak. Loved your photo’s; what a beautiful please. Really enjoyed reading your experiences. I’m in love with this post! As a fellow sunset and sunrise chaser I love all of these pictures! This place looks like the perfect place to capture sunsets and sunrises. I love the swing and hammock that can be used in shots, as well as used in the water. I’ve never been on a swing in the water. So beautiful and peaceful. Wow this looks like an absolutely wonderful destination. I love that there are no motorised vehicles, I’d love to cycle around an island like this. And the swings look really cool, what a great idea to view the sunset! Thanks for the inspiration, added to the To Visit list! Such a beautiful place…those swings look like a great place to take it all in! I love the idea of a swing in the water! It is such a beautiful spot. It’s not a part of the world that I really know, but to find an unspoilt part of the world is rare today. Gili Trawangan seems to fit the bill. It’s a stunning place, isn’t it! I am in love with your pictures. The glass bottom boat ride must have been a memorable experience. Those dramatic swings in the sea must be the most instagrammed picture from this beach. And they have 4 of them. Whoa! I love what you had to say and how you captured a magical moment in words. Too often, we are so anxious to get to the next thing, or capture the perfect picture that we forget to take a moment and enjoy where we are. You were able to do this and wrote about it beautifully. Even if your swings picture wasn’t as planned, it might be a better picture because of the journey you took to get to that one moment in time — standing on the swing and watching the sunset. Lovely post and the pictures are really flattering to the surreal landscapes that you have captured with perfection. The sea, the swings, the sun, the sky all seem to come alive in vivid colour through your stunning pictures. Even though you have sounded a warning note for vegetarians, I would love to head out there and fill myself with the beauty of the place, never mind if I go hungry, I am sure it will be well worth it. What a perfect place to enjoy Sunset!! I just love the idea of standing in a swing in a sea and watching sunset. Wow, this is the first time I’m hearing of Gili Trawangan Island! It’s going on my travel list RIGHT NOW! Your photos are absolutely stunning, what a beautiful part of the world. We recently spent some time on the Gili islands and just loved it over there, they are just the most perfect and magical places to escape the world! This must be how paradise looks like, Divsi. The Gili Trawangan Island is on my bucket list and I really hope to cross it off soon. When’s the best time of the year to explore it?